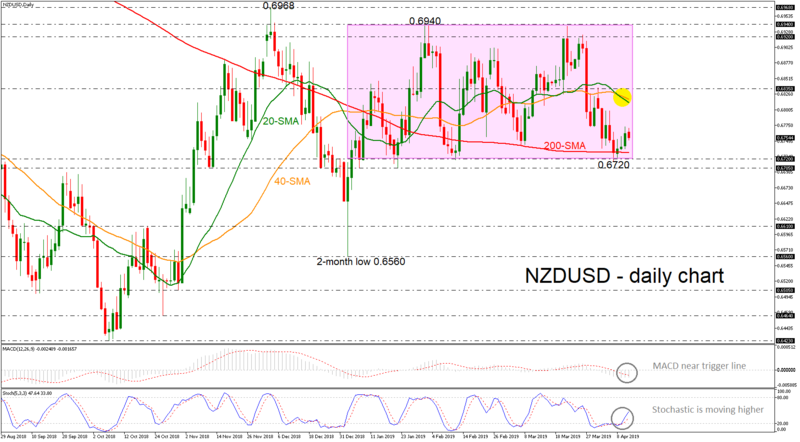 NZDUSD has been developing within a consolidation area over the last three months with upper boundary the strong resistance level of 0.6940 and the support level of 0.6720. In the near term, the price rebounded on the 200-day SMA, posting three positive days. Technically, the %K line of the stochastic oscillator is gaining ground after the bullish cross with the %D line in the previous days, while the MACD is trying to advance above trigger line in the negative territory. An extension to the upside could find resistance around the bearish cross of the 20- and 40-simple moving averages (SMAs) currently at 0.6815, while higher up, immediate resistance is coming from the 0.6835. If the bears manage to take control and penetrate the sideways channel, support is coming slightly below the lower boundary near 0.6705. A close below this level as well, could confirm the forthcoming bearish structure until the 0.6610 area. Overall, NZDUSD lacks direction and investors should be waiting for an exit of the range before placing orders.